2009: Can it be eggs? 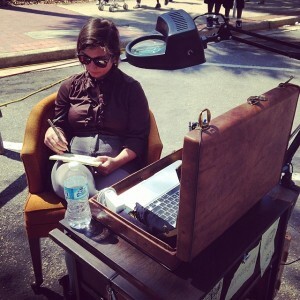 As 2014 Indie Grits Film Festival artist in residence I worked at a mobile desk that I carted to festival events in downtown Columbia, SC. At the desk I documented the events in drawing on a steno pad, and responded to random requests from festival goers. The drawings were given away after being scanned on the mobile desk’s flatbed scanner and shared via the Indie Grits Twitter.